BROADCASTER Ryan Tubridy kicked off his week-long journey along the Wild Atlantic Way with a live broadcast from sunny Buncrana yesterday. The RTE star gave the seaside town and wider Inishowen area a great plug on the national airwaves as he gave shout-outs to local people, traders, schools and the local media. He said he thoroughly enjoyed his stay at the beautiful Red Door in Fahan. He welcomed schoolchildren from Scoil Iosagain; Scoil Mhuire and the local Gaelscoil. He also described how he enjoyed a day-trip around the peninsula on Sunday before taking in a spot of sea angling at Malin Head. The 43-year old broadcaster started his visit to Buncrana with a visit to the local Post Office where he picked up the first stamp on his ‘Wild Atlantic Way Passport’. The new €10 passport, from Fáilte Ireland in association with An Post, provides visitors with a unique souvenir of places they visited along some, or all, of the 188 Discovery Points on the Wild Atlantic Way. 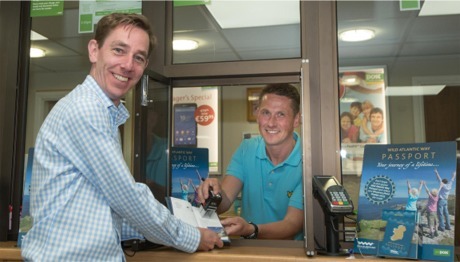 Ryan Tubridy meets Buncrana post master Christian McGinley and gets the first stamp on his Wild Atlantic Way passport. Local post master Christian McGinley and staff were delighted to welcome the broadcaster to the Main Street. Meanwhile, Fáilte Ireland head of the Wild Atlantic Way Fiona Monaghan said the new passport was designed to "increase tourist activity and engagement with people and places" along the world's longest coastal touring route.